Select a balanced AAC system, based on core words with quick access to fringe vocabulary, and the alphabet. Selecting the AAC your learner needs is an essential step in the AAC journey. And we should start with the end in mind. Presuming competence means that ultimately, we hope for the user to be able to do more than use nouns to make requests. Our goal is for them to learn to combine words into sentences to express thoughts, feelings, and opinions. We also want them to learn literacy, so they have the freedom to say exactly what they want to. To get here, we need to provide AAC users with a system whose vocabulary includes many words in every grammatical category. We also need to provide access to the alphabet. These are the building blocks of language and communication. With exposure and opportunities to practice with these building blocks, AAC users can get to independent and successful communication. In more technical terms, this means that you should choose a balanced AAC system. This means an AAC system with a core word-based vocabulary, but which also gives quick access to fringe vocabulary and the alphabet. This article will outline the different components of a balanced vocabulary designed for growth of language skills in a AAC user. A balanced AAC system is based on core words, with quick access to fringe vocabulary and the alphabet. Firstly, what are these core-words? Core words include mostly verbs (“go”, “come”), adjectives (“good”, “little”), prepositions (“to”, “on”), pronouns (“you”, “that”), articles (“the” “a”), and conjunctions (“and,” “but”). Only about 10% of the top 200 core words are nouns. These nouns are very general (“girl”,“house”) rather than specific (“porcupine”, “celery”). Providing AAC learners quick access to these core words gives them a powerful and flexible tool to communicate whatever they want to say. They do not have to rely on preprogrammed sentences or phrases such as “I want” and “I see”. Instead, they can choose from a relatively small set of words to create their own sentences, express ideas, and work on grammar. Using core words, they can learn to communicate for a wide variety of reasons. Communication is not limited to choosing from photos of objects. Rather than learning new curriculum words for each new lesson, they can build their language skills by using a consistent set of flexible words to answer open-ended questions about curriculum topics. While using core words is important, it does not mean that we do not provide other essential vocabulary. An AAC system should include core words alongside “fringe” words. Fringe words are very specific words with a more narrow meaning than core words. They have a different kind of power; the power to precisely describe something in as few words as possible. Fringe words are usually nouns, but more specific verbs (“leap”, “dice”) and adjectives (“elegant”, “delicious”) are fringe words as well. Each individual fringe word is not used as often as each core word. For efficiency, AAC systems are usually arranged with the core words on the first, or “home” page. Fringe words are located in other folders. There are many many fringe words. But not all fringe words are equally important for every person. Each of us has certain subjects that we really love to talk about: the most important people, places, and things in our lives. These words are different for each person. One of the most important parts of setting up someone’s vocabulary is making sure their most important fringe words are available. We want to make sure these are easy to reach in the fringe folders, without too many navigation steps. In addition, all AAC systems should provide access to a keyboard. Even if the user can't read or write yet, the ability to "scribble" is important. Communication partners can model writing on the keyboard also. The AAC user should have the ability to start scribbling/writing and seeing writing with a keyboard on their AAC as soon as possible. 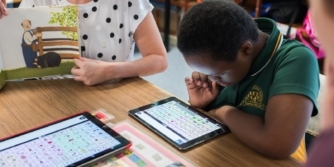 Core words, along with easy access to fringe words and a keyboard, make up a balanced AAC system. This allows for powerful and independent communication for AAC learners. Providing AAC learners quick access to core words gives them a powerful and flexible tool to communicate whatever they want to say. Some AAC systems rely heavily on pre-programmed phrases and sentences. This pre-programming involves scripting sentences. It depends on predicting what an AAC user wants to say and adding those sentences to a page. While this can be useful at times, it is far more important to establish communication based around core and fringe words. This gives the AAC user the opportunity and the vocabulary to independently say whatever they want, in any situation. In balanced AAC systems, we need to consider using pre-programmed sentences differently. Ideally, the AAC user should write the included phrases. If they can't write using the alphabet yet, they can use the buttons on their AAC system to write instead. Rather than the people around them guessing what they want to say, an AAC user can write the message and then save it onto a button to use later. This saves them time and ensures successful communication. It also means they are saying their own words, not someone else’s! Here is an example: An AAC user always wants to know what is happening next! Using core word vocabulary in Proloquo2Go, he starts regularly writing out questions for his parents. It starts as “what do?”, then “what do weekend?”. With some modeling, eventually he was able to combine seven buttons to ask “what will we do on the weekend?”. He asks this question a lot. We know he can say it. Does he have to prove himself every day by rewriting this message? No! Instead, we save this message onto one button in his Questions folder so he can say it quickly and easily anytime. Pre-programmed phrases and sentences can be useful when used in this way. Other examples include: writing news and stories, saving favorite topics and ideas to talk about, pre-writing what you need to say for medical appointments, and having phrases to quickly say during difficult situations. While we can see how useful pre-programmed sentences are, they should not be the key focus in an AAC system. Phrases and sentences should be added within the AAC system alongside their core words. This way, the AAC user can build upon them with their vocabulary of core words for more interaction and real communication. When pre-programmed sentences by themselves are the priority pages in an AAC system, we are not giving the AAC learner the chance to develop independent communication. We have considered carefully the importance of core words, fringe vocabulary, the alphabet and preprogrammed phrases in an AAC system. This helps us choose the best AAC system for our AAC user, from all the different options available. Once you have your AAC system chosen, the next step is to start customizing and personalizing the system. This includes choosing how many buttons you will start with on the page. This article is just one in the Learn AAC series about “Setting up for AAC”. A full list of core word references can be found in the AssistiveWare Core Word Classroom. Useful core word resources can also be found in the AssistiveWare Core Word Classroom. Do’s and Don’ts of AAC - Core words. What is “Beginning AAC”?, Jane Farrall. Blog post on Core Words from AssistiveWare. Valuable youtube video on Beyond the Basics: Core consideration in AAC intervention. Blog post from PrAACtical AAC on Core word vocabulary. Consider different vocabularies in Proloquo2go. This guide contains key elements for symbol-based AAC users to become successful communicators. Use it to help set priorities, plan next steps, find more information and problem solve. Would you like to give your child the means to communicate more fully? Follow these recommendations to take them from requesting to a full communication system.